I have a new comic section at The Rumpus now called Folk Talk. The latest comic–although I’d hardly call it a comic, more so sketches with text – I’m no artist! It’s about a cigarillo a man (or woman, not very definite) finds on the beach and his assumptions of its smokers’s character. I adapted it tfrom a short story of mine with the same title, of course it’s pared down quite a bit. 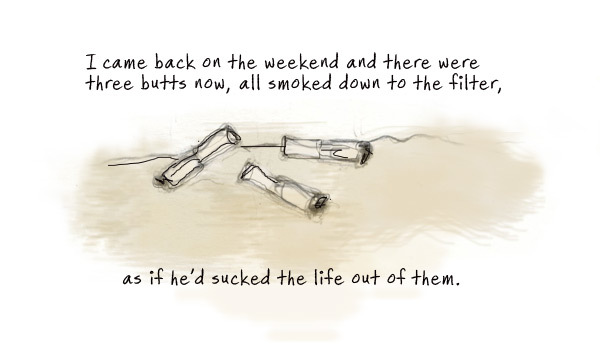 The idea stemmed from some cigarillos butts I found on the beach one day. Other postings at Folk Talk will be more collaborative work with Kara Jansson. A sort of continuation of the Boyfriends series. Here’s an excerpt. The rest can be read up @ the Rumpus. Death is Gods way of telling you not to be such a wise guy.